Before planting potatoes, you should be sure that the soil has been well prepared in your garden. The dirt needs to be loose and airy to a depth of at least 10-12 inches. It should also be free of rocks. 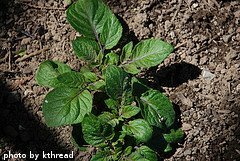 If there are rocks in the garden or the soil has been compacted, the potatoes will not have adequate room to grow successfully. Once the soil has been adequately prepared, you're ready to begin. 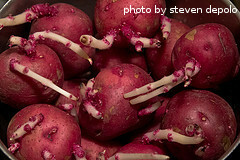 To avoid diseases and problems later on, we strongly suggest you plant certified seed potatoes. These are available at most seed stores and catalogs, along with the garden departments at major home improvement stores. A couple of weeks before planting seed potatoes, cover them with a damp cloth or paper towel and keep them inside at room temperature. This will encourage them to begin sprouting. If the seed potatoes are whole and have enough eyes, you can go ahead and cut them into pieces at this point. Just use a knife and cut the potatoes so that each piece has 2-3 eyes. If you do this now, the cut sides will have a chance to harden up before planting, which will help prevent problems later on. If your seed potatoes are small, you can just leave them whole. Potatoes should be planted 1 foot apart in rows that are spaced 2 feet apart. They should be planted a few weeks before the last frost in your geographic area. The soil needs to be at least 45 degrees F to get good results. Also, avoid planting in cold, wet soil as there's a great chance of rot. In the deep South, it's possible to grow two regular potato crops, one in the early spring and the other in the fall. Use a hoe and create a row 6 inches deep. Place the potato tubers in the row with the sprouts facing upward. Cover the tops of the tubers and sprouts with 3 inches of soil. Water them in well. 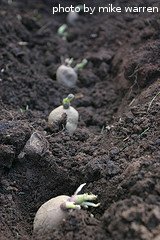 Once the sprouts emerge, cover them with another 3 inches of soil. The potatoes that will make up your crop will form in the soil between the tuber and the sprout. After the sprouts have re-emerged, wait until they reach 6 inches tall. Then add 3 more inches of soil to cover the sprouts halfway up. The sprouts will continue to grow. When the sprouts are again 6 inches tall, add another 3 inches of soil to cover the sprouts halfway up. Continue this process every 2 weeks or so until the sprouts begin to blossom. After the plants blossom, no additional soil is necessary. After planting potatoes, it's time to water, fertilize, mulch and finally harvest them. Click on the following links to learn more about these steps.